One of Arden Berge's most surprising discoveries while he was a graduate student in meteorology had nothing to do with the weather. "I'd been lying on the bed reading, and all of a sudden I looked up and there were paramedics standing over me," says Berge. He'd soon learn why. He'd had a seizure, and his girlfriend, Deb (now his wife), called 911 for help. Berge was taken to a hospital, where he had another seizure. He was diagnosed with epilepsy. While epilepsy is most commonly diagnosed in children or adults over 65, it can develop at any age. The cause of the disorder can sometimes be traced to a head injury or medical issue, such as meningitis or encephalitis. But in about half of all cases - including Berge's - there is no identifiable cause. While it was a scary diagnosis, medications made the condition manageable for Berge, who finished his degree and started his career. He adjusted to life with seizures and to the side effects of medication. Then, 33 years after his diagnosis, a trip to Mayo Clinic offered the possibility of a seizure-free life. Since the time of his first observed seizure in 1978, Berge has been on medication to control them, he says. His medication regimen grew over the years. And by 2011, Berge was taking three different medications and 15 pills a day in an attempt to eliminate his complex partial seizures. But the medications weren't having the intended effect. "The more medication I took, the less control I seemed to have over my seizures," he says. Roughly a dozen times a month, he would get a familiar feeling in his stomach. "It felt like butterflies, or riding on an elevator," he says. Then, for up to 30 seconds, he would experience the sense of altered consciousness or awareness that is the primary symptom of his type of seizures. Usually, Berge's seizures would pass without incident. But not always. He once poured a cup of hot coffee on his lap during a seizure, landing him in the emergency room with serious burns. Berge lived with the side effects of the medications, too. "They made me feel sluggish and tired, like I was trying to walk through really thick mud." Though epilepsy had its challenges, Berge says he did not let himself be limited by them. 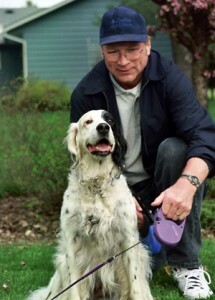 After finishing his master's degree, he worked for more than 30 years as a meteorologist for the National Weather Service, eventually supervising a team of meteorologists at the Minneapolis Center Weather Services Unit in Farmington, Minn. Over the years he and Deb adopted several abused or neglected dogs, including an English setter named Happy who could tell when Berge was going to have a seizure. "If we were out on a walk and I had a seizure coming, Happy would get antsy to go home," Berge says. Berge's life likely would have continued unchanged, were it not for an unrelated health issue. In 2011, doctors in the Twin Cities discovered a tumor on Berge's neck. Though benign, the tumor was intertwined with major arteries in his neck and a nerve in his face. The complexity of the tumor prompted him to seek care at Mayo Clinic. "The neurologist I met with asked if I'd ever seen a Mayo physician for my epilepsy," says Berge. He hadn't, and was quickly referred to Gregory Cascino, M.D., in the Department of Neurology at Mayo Clinic. There, he heard something that surprised him. "Dr. Cascino told me that Mayo had been treating my type of epilepsy with surgery for over 20 years," Berge says. "I'd been seeing a neurologist in the Twin Cities since 1985, but no one had ever mentioned surgery to me before." Though medication is the first line of treatment for epilepsy, in some cases it isn't effective. Surgery may be an option for patients who have tried unsuccessfully to control their seizures with at least two different medications. Berge more than met the criteria, and he decided to have surgery. There was one more decision. Which type of surgery? Dr. Cascino explained that Berge could have the standard surgical procedure, which would involve removing a piece of his skull to gain access to the part of the brain where his seizures originated. A surgeon would then remove the problem tissue and replace the piece of his skull they'd removed. Recovery could take up to three months. Or, he could have surgery using a new technique being tested at Mayo Clinic. Surgeons would drill a small hole in his skull and use an MRI-guided laser to destroy the problem tissue. Recovery would be much quicker. But, Berge would be the first patient at Mayo Clinic to have the procedure. He didn't hesitate to choose the new option. "It made my wife very nervous," Berge says of being the inaugural patient. "But I wasn't too concerned. I know what it takes to do an experiment. I understood the process as a scientist. I also trusted Mayo Clinic." That trust was well placed. On Oct. 18, 2011, Berge was wheeled into an operating room at Saint Marys Hospital, where a team led by Richard Marsh, M.D., Neurologic Surgery, performed the procedure that Berge hoped would change his life. "I haven't had a seizure since having surgery," says Berge, who can't help but wonder whether other people living with epilepsy are unaware, as he was, of the full range of options available to treat the disease. "The neurologist I was seeing in the Twin Cities was very nice and very thorough, but he wasn't associated with a large clinic," says Berge. "There are only a few places in the country that do what Mayo Clinic does."